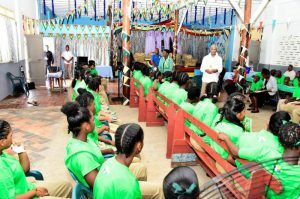 Guyana on Thursday abolished several offences that could be committed by children, with the passage of the Juvenile Justice Bill which will replace a more than 80-year old colonial era law. Government refused numerous requests by the opposition to take the Bill to a parliamentary select committee to address numerous concerns. In kicking off parliamentary debate, Minister of Public Security, Khemraj Ramjattan announced that with the passage of the draft law, status offences such as wandering, vagrancy and truancy would no longer be criminal offences. “These offences must be abolished and they have been abolished in this Act,” Ramjattan told the 65-seat House. He said often times those actions are as a result of psychological or socioeconomic problems facing girls and street children who are “often victims of this kind of criminalisation”. After criticisms and recommendations by opposition, Ramjattan said “we have indicated that it will not be going to any select committee. This government will set its legislative agenda, not the opposition.” He said the Bill before the House was largely the same that the coalition government had inherited in 2015 from the now opposition People’s Progressive Party. Minister of Social Protection, Amna Ally said about 70 percent of the residents at the New Opportunity Corps, Essequibo Coast have been incarcerated for wandering. The Public Security Minister said the old law was discriminatory because adults could not be charged under any law for a number of those status offences. “There is an inherent destruction here and discrimination on the grounds of age,” he said. In addition to the need for “mindset changes” by professionals at existing youth justice institutions, the Minister said “huge amount of resources” would have to be found for the establishment and staffing of placement facilities, a director of juvenile justice, a juvenile justice committee, and the retraining of policemen, prosecutors and judges. Ramjattan credited the United Nations Children’s Fund (UNICEF) and local consultants especially Attorney-at-Law, Rosemary Benjamin-Noble for spearheading the reform of the relevant laws. They include the Juvenile Offenders Act, Education Act, Probation of Offenders Act, Rehabilitation of Offenders Act and the Parole Act. If a juvenile is convicted, the new law prohibits the recording of a conviction against his or her name as part of a mechanism to protect him or her. ‘The emphasis is on giving the juvenile another chance to take up his rightful place,” said Attorney General, Basil Williams. Opposition People’s Progressive Party parliamentarian, Dr. Frank Anthony noted that the legislative reform dates back to 2004 when Guyana was told that its current laws were not in conformity with the United Nations Convention on the Rights of the Child. Anthony, a former Minister of Youth, recalled that in some instances families of incarcerated youths had been reluctant to accept their children because of poverty and space. He said mentoring had been also provided with assistance from the United States Agency for International Development. He also objected to the proposed increase in the age limit from 10 years to 14 years at which a child cannot be charged because it is presumed that such a person will not be capable of or guilty of committing an offence. Anthony suggested that Guyana considers the approach by Scotland where the minimum age is eight years, but there are are special mechanisms to address some instances if necessary. He proposed 12 years as Guyana’s limit. “That is something we have to look at because that is not expressed in the Bill before us,” he said. Adding her concerns was Shadow Education Minister, Priya Manickchand who urged her fellow legislators to consider the realities of Guyana in which youths had been used to commit crimes. “There was a time when people said young people who were exploited commit crimes were freedom fighters,” she said. The Public Security Minister said the Bill places a great emphasis on rehabilitation instead of incarceration/custodial sentences only in cases of last resort. “We want to see an Act which provides a framework where professionals are in the forefront supporting juveniles rather than the police and prison wardens. We do not want to make a jail house nation of our young people,” he said, adding that “in this day and age we have to find a humane alternative to incarceration for our young law breakers”. PPP parliamentarian Dr. Vindhya Persaud recommended a special juvenile court, specialised lawyers, counsellors, the provision of community-based services for rehabilitation and reintegration, right to privacy through media coverage. The Social Protection Minister said the law provides for juvenile offenders to be provided free legal aid, diversionary strategies and other forms of support. Manickchand appealed to the government to send the Juvenile Justice Bill to a bipartisan parliamentary select committee, saying that no time would be lost because government was not yet ready to provide the necessary systems for the prosecution of juveniles in keeping with the new law. The Bill mandates that juveniles be provided free legal aid, psychological evaluation and permission from the Director of Public Prosecutions first before private criminal charges could be filed against a child. Backing calls by his colleagues for the Bill to be dispatched to the parliamentary select committee to generate a much more “indigenous perspective”, former Minister of Home Affairs Clement Rohee accused government of importing a United Kingdom-model law that is not in keeping with Guyana’s customs and mores. Rohee questioned whether or not youths, who commit offences jointly with adults, would be charged. Responding, Ramjattan the child would not be charged. If the Bill would be “rushed through” the House instead of being taken to the Committee, PPP front-bencher, Gail Teixeira called for GYD$81 million to be spent on putting the necessary systems in place to implement the law instead of constructing a fence at the New Opportunity Corps. Teixeira made several recommendations, from the floor, including the removal of solitary confinement from the Bill, clearly defined qualifications for the director, and alternatives to dealing with wandering and truancy.